As sustainability becomes an ever more omnipresent topic, a dozen contributors have collected ideas on Green Best Practices for hotels to help increase sustainability amongst accommodation providers. Many of these highly actionable thoughts even reduce operational costs and save the hotels money. If you work for a hotel, please pass this on to your management team. If you’re a traveler, please share this with the accommodations you stay in. Update April 2018: After collecting a lot of valuable feedback from like-minded people, the below article has been extended and now contains ideas from about a dozen travel and nature enthusiasts. Should you have any ideas to add, please contact me. Great news for hotels and hotel employees: There are actually tons of green best practices for hotels that will save you loads of money, while earning you positive reviews on TripAdvisor for your eco-friendliness. I don’t want to claim to have listed them all in this article, but hopefully it is sufficient as a little fire starter. Feel free to use these 10 completely free marketing strategies for startups and SMEs to spread the word on your achievements! To all environment-loving people out there: If you know a hotel that can improve its green best practices with a hack or two from this list, please share this article with them. Having worked in hospitality myself I know how easy it is to get a caught up in daily routines, and how much hoteliers value feedback from past or potential clients. Oh, and: Next time you book a hotel, do so via B’n’Tree: You book a bed, we plant a tree. Every tree counts, and it doesn’t cost you anything. Seeing a monster article like this can be super daunting at times. But don’t worry – nobody expects you to turn all steps into action overnight. On the contrary: Select one or two ideas you and your team can agree to work on – and then go make it happen. Once all agreed measures are successfully implemented, revisit this article to find another hack or two that inspires you. But most importantly: Do something. Today is the best day to start. I have worked in the tourism and hospitality industry for over ten years, and successfully led a Thai hotel to become finalist in National Geographic’s prestigious World Legacy Awards for ‘Conserving the Natural World’. 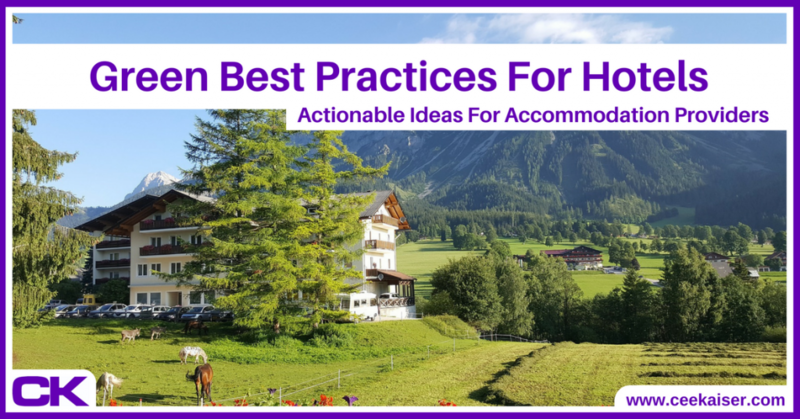 During this time, I have collected a few ideas and tips for hotels that help reduce the ecological footprint, and often even save quite a bit of money. All while keeping the service level at the same standard, if not increasing it. Besides, below selected green best practices for hotels and other accommodation providers are compiled from over a dozen other nature-loving travelers. Some of these ideas will save you money, some are cost-neutral, some may cost you money, but in the latter case it’s an investment that is well worth it. Take a look, and let me know in the comments all the special hacks that I missed to mention. Generally speaking, saving resources will save you money. And saving resources in the hotel industry is everything but difficult. Just don’t rely on your clients to help you save resources – be proactive! Turn all electronic devices off by default. Many hotels waste electricity by switching on all lights, the TV and the air-con when clients enter the room or put their keycard into the respective slot. Install energy-efficient lighting. In the rooms, in the lobby, throughout the floors. Two notes on this: Firstly, please do respect this sign. If clients put their towels back on the rack, don’t wash them. Clients are annoyed if they want to help you save the environment, but still find a new towel on the shelf every time they return to their room. And secondly, please don’t stop your efforts then and there. There are loads more ways to save water, and hence the environment as well as money. Do less laundry. By offering smaller towels and less towels (2 towels per person are enough!). Since you can never be sure who touched which towel, most hotels wash all towels in a room when preparing for the next guests. Ensure the taps for hot and cold water are easy to handle. Few things are more annoying than a water temperature that jumps from ice-cold to burning hot and back every time you slightly touch a tap. Bathroom amenities seem to be a must. Yet, done wrong, they can increase costs unnecessarily, and pollute the planet at the same time. What a wonderful opportunity to show your hotel is environmentally friendly! Offer shower gel and hand soap in refillable dispensers. These can be beautifully branded, look fantastic, are easy to refill and nobody steals them. Much better than little plastic flasks that people take home and throw away after the third use. Offer amenities like razor, tooth brush, shower cap etc on request at the reception. If they are displayed in the bathroom, guests either take them home, or they have to be replaced regularly because they get wet and look unpresentable. Same as with bathroom amenities, bedroom amenities often receive too little thought. Be different – stand out. Your guests will love you for it. And so will mother nature. Plastic bags in bins are absolutely not necessary. Yes, in the bathroom they might be, but not in the bedroom. Use biodegradable plastic bags for those bathroom bins. For note-taking, consider using pencils instead of plastic pens. They do the job just fine, yet carry a much smaller ecological footprint. Worst-case scenario: A Nespresso machine in the room. The machines are largely made of plastic, and we all know the capsules are horrible for the planet, no matter whether Nestle tells us they are recyclable or not. While talking about the tea and coffee: Please offer ceramic cups at the minibar as well as wooden or stainless steel spoons. Bedtime treats don’t have to be plastic-wrapped chocolates. The Swiss Art hotel Teufelhof for example had a small book with poems on the bed. Interesting choice – and it stuck to mind for being so different. Laundry bags could be made of paper or other recyclable material. Offer fresh apples at the reception desk instead of plastic-wrapped lollies. Apples are healthier, too. When clients ask for directions, ask them if they need a printed map. Most people have smartphones these days, and just need the street name. Or they only want to wander down the road, and usually don’t need a map. Sure, have some handy, in case someone asks, but don’t throw them at everybody like confetti at carnival. Upon check-out, ask for the keycard. It is so easy to forget in your pocket as a guest, and so useless once you checked out. Offer to send receipts via email, if needed. If receipts need to be printed, ask whether the client needs an envelope. Chances are they don’t. In case clients hang a “Do not disturb” sign on their door: Don’t push a paper beneath the door stating “Housekeeping was here, if you need us call 911”. Surely people are smart enough to pick up their telephones when they need housekeeping. No need to waste paper. WiFi codes don’t need to be printed these days. Either offer WiFi without password (hoorray! Traveler’s paradise!) or use a simple system with room number and last name as user name and password. Regards the little paper room card evelopes: Ditch them. Most guests can recall their room number without a throwaway piece of paper wrapped around it. There are loads of cost-neutral green best practices for hotels. Oftentimes, it is hard to generalize the exact cost of an environmentally friendly measure, since costs depend on scale. Other times you do have to invest a bit of money to save money in return. Either way, measures that won’t burn you a massive pile of cash are listed here. Most hotels offer some kind of restaurant. Even if you subcontract a restaurant, you should ensure they are following at least some green best practices, as otherwise this might shed a bad light on your hotel. Most clients have no idea who is owned by who. Butter and jam doesn’t have to be served in small plastic containers. Offer home-made jams or regionally produced delicacies, best put into small ceramic bowls. Some hotels offer small jam cups made from wafer – after the jam is spread on the bread, the wafers can conveniently be eaten. Don’t use plastic straws. If your clients need straws, buy reusable ones, made from stainless steel or glass. They also look a lot classier than a cheap plastic straw, and can conveniently be branded (and sold in the souvenir shop). Don’t ask for printed hotel vouchers. We’re not in the 20th century any longer. I traveled for years without printing a flight itinerary or a hotel confirmation, until in August 2017 a hotel in Switzerland demanded exactly that. And I keep wondering: Why? Great move from Crowne Plaza in Copenhagen: They offer rewards for skipping room service! Usually it’s a drinks voucher for the hotel bar, which then draws customers into the bar. Smart concept. Plus, less room services means less laundry and less working hours for the housekeeping team – a total cost saver! There are of course thousands of things one can do to save nature that cost money. Since few people spend money just to protect the planet, we only listed ideas that either don’t cost millions or will amortize themselves at some stage. Investing in proper hotel software costs a fair amount of money, but does pay out very soon. Bookings are made a lot easier, processes become quicker, clients can be served faster. And, in the best case, you can move towards a paper-free office. Mother nature sends you a massive smooch for that! Invest in a proper backend. Thanks to modern technology, guests can sign in and out and their bills on a tablet. Even taxis have that – so why shouldn’t you? The beauty is, digitalized documents are a lot easier to find, and stored data can be perfectly used for marketing. Source energy from renewable sources, such as solar power or biothermal energy. The investment here is not to be neglected, but surely your business is in it for the long run anyway, isn’t it? Substitute all needed plastic bags (such as in the bathroom bins) with bags made from biodegradable material. Use recycled toilet paper. Make a statement. For any print jobs: Use recycled paper. Unbleached. Use local material and craftsmen to build furniture. This might not always be an option, depending on where you are located, but if it is, it makes a big impression. Your hotel becomes a whole lot more authentic, and clients value that. Once major renovations are due, remember insulation for windows, walls etc. Long-term, this saves you heaps on heating / cooling costs. Thanks for reading till the very end. You are awesome! Please feel free to leave your comments and thoughts below, New ideas will constantly be added to the article if appropriate. And: Please share this article with people who have the power to change the planet!